[Friday May 22, 2009: I feel like the kid who comes to school, all big-eyed and sorry, with the story "the dog ate my homework." Give me a couple of days and I'll be back. Until then, here's what we've been cooking - recipes from Bobby Flay's Burgers, Fries and Shakes. That's his barbecue sauce in the photo. I have been overruled. Vetoed. If our house was an island, I'd surely be the one voted off of it. Let me explain. I was offered the opportunity to review Bobby Flay's latest book, Bobby Flay's Burgers, Fries and Shakes (Clarkson Potter, 2009, written with Stephanie Banyas and Sally Jackson). While I am not familiar with Mr. Flay's food, I accepted immediately with others' interests in mind. My husband l-o-v-e-s a good burger, especially paired with a mound of crisper than crisp fries - the sort that crackle when tumbled out on a plate. Our three-year-old son Benjamin has inherited this burger-loving gene, and along with it that same sincere love of fries. So I could not, with good Mummy-Wife conscience, turn down the offer. The problem was, as much as I do enjoy the subject matter, I do not know if I am all that keen on this book. These two though, cannot praise it enough. But, I am getting ahead of myself. Rewind to a few weeks ago. With the Victoria Day holiday just ahead of us, the long weekend would be the perfect opportunity to peruse the Mr. Flay's offerings. Nothing seemed better to flip through, and cook from, as you laze about around the backyard grill in the late-afternoon sun. But that is where we ran into trouble. While I am ardent in my desire to eat these burgers, fries and milkshakes, I am not all that inclined to make them. Reading this book was like looking over the menu of a really, really good diner. The photographs by Ben Fink are in-your-face beauty closeups; burgers are lavishly-treated with toppings, you can see the grains of salt on the fries, and shakes look so good you want to lick the page. Speaking of the barbecue sauce, after trying Flay's blend of ketchup, molasses, honey, brown sugar and spice, Benjamin christened the sauce "spicy ketchup", and I am inclined to agree with his description. 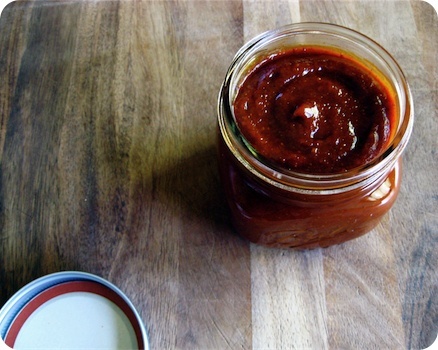 The barbecue sauce is a good condiment, and is Ben's new favourite dip. But as far as an all-purpose grilling sauce goes it lacks the deeply sweet tones, the almost-sticky quality I look for in a barbecue sauce. It was simply too tomato-y for our tastes. Another issue with this recipe was the instruction to purée the sauce in a food processor. I do not know if it is that Flay uses a vastly-superior appliance, but my Cuisinart was unable to smooth out the mixture to a classic barbecue sauce consistency. After multiple blitzes in the food processor, you could still detect distinct bits of onion and garlic, swimming in the liquid. A quick buzz with the immersion blender did the trick. The burgers are good; really good, in fact. But as Flay prefers a simple burger recipe allowing the flavour of the beef to stand front and centre, with most variations using a standard patty recipe. After that's established, it really is just about toppings, with everything from the Napa Valley Burger (with Meyer Lemon-Honey Mustard) to the Arthur Avenue Burger (FraDiavolo Ketchup, FontinaFricos) to the Patty Melt Burger (Red Wine Onion Relish, melted Gruyère cheese, scratch-made Pickled Jalepeños). There are chicken, turkey and fish burgers, but these are obviously second string - the beef burgers are the stars. The Fries chapter includes his "perfect" recipe, a Bistro twist (parsley, garlic), fat Steak Fries, and then versions using alternative starches like plantains and sweet potatoes. The section is rounded out by mention of onion rings, including the truly-addictive Shoestring Onion Rings; whisper-thin, buttermilk-bathed beauties fried to golden deliciousness. The Condiments and Seasonings chapter was a surprise. It is a thoughtful inclusion, and in my opinion, the hidden gem of the book. The Homemade Dill Pickles or Horseradish Mustard Mayonnaise just two of the of simple recipes that would make any backyard cookout immediately special. As anyone who knows me would surely suspect, the Milkshake chapter was far and away the highlight of the book for me. These recipes were the stuff of childhood dream, truly decadent desserts masquerading as drinks. The Toasted Marshmallow Milkshake is like drinking the campfire treat, but creamier. The Dark Chocolate Milkshake with "Fluffy" Coconut Cream is a parfait-style showstopper, while the Blueberry-Pomegranate Milkshake is a tangy take on the traditional shake. Bobby Flay's Burgers, Fries and Shake is a good book, a novelty for summertime reading, and it does offer up some inspiration for creative burgers. This is not everyday food, and in my mind, not once-a-week food. The recipes often verge on more labor-intensive than I prefer for a casual weekend meal, requiring multiple garnishes and some last-minute fuss. And while the milkshakes are delicious, they are a rare indulgence. It is the sort of cookbook I would pull out for if I was cooking for a true burger lover and wanted to treat them to something special. A signature burger for Dad on Father's Day perhaps? That said, I do appreciate Mr. Flay's attention to detail, with each chapter beginning with a thorough discussion on ingredients, technique and his personal preferences. There is no doubt that Flay is passionate about the subject matter. And while I am just not all that passionate about the book, I am surely in the minority as my husband and eldest would be all-too-happy to tell you. Maybe its because I am the one doing the cooking.